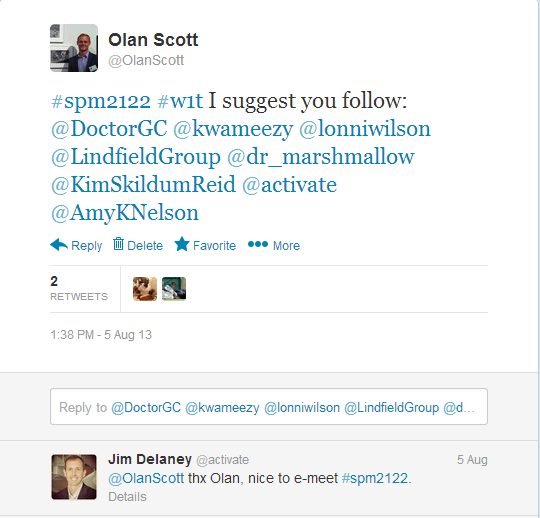 As many of my readers know, I actively use twitter in my university classroom teaching. 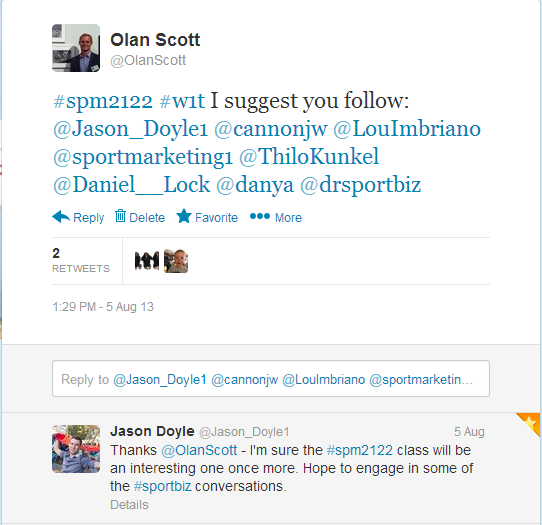 In particular, I use it most in my Sport Marketing unit (tagged #spm2122). Twice during the semester, a lecture is replaced by an online discussion on Twitter. The focus of the online lecture is the content from the four weeks prior. Here are the four topics that will be discussed in a QandA fashion on the 27th of August 2013 that starts at 12:30PM Perth time. Live Tweet topics for 27 August 2013 that starts at 1230 (12:30 PM) Perth time. The Smith textbook outlines two streams of sport marking, which is unique to the sports industry. “Sport marketing is the application of marketing concepts to sport products and services, and the marketing of non-sport products through an association to sport. Sport marketing therefore has two key features. First, it is the application of general marketing practices to sport-related products and services. Second, it is the marketing of other consumer and industrial products or services through sport. Like any form of marketing, sport marketing seeks to fulfil the needs and wants of consumers. It achieves this by providing sport services and sport-related products to consumers. However, sport marketing is unlike conventional marketing in that it also has the ability to encourage the consumption of non-sport products and services by association” (Smith, 2008, p. 3). 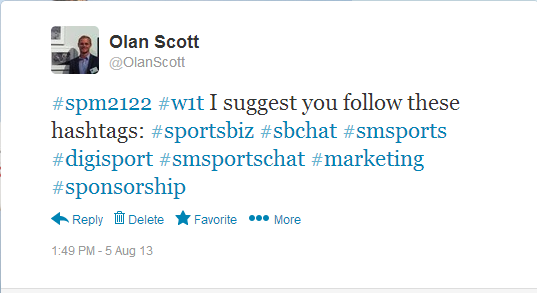 In our online discussion, we will discuss both of these concepts and apply them to sport marketing using social media. In week four, we discussed three ways in which sport organisations can collect data. These were: General market data, individual consumer’s data, and competitors and/or participants’ data. General market data include all the information which relates to the broad environment in which the sport operates. Individual consumer’s data concerns their attitudes and behaviours related to a specific sport product or service. A third source of information for sporting organisations relates to competitors and their participants. It is critical that sporting organisations not only be aware of who their competitors are but also know the consumers of a rival’s products or services (adapted from Shilbury et al., 2009, p. 65). The Big 5 Sport Motives represent a comprehensive view of major psychological inputs that represent core benefits consumer receive from engaging in sport consumption (adapted from Shilbury et al., 2009, p. 49). Various research (Beaton et al., 2007; James et al., 2006) has found that there are “five main psychological benefits that sport consumers desire from a sport experience” (Shilbury et al, 2009, p. 48). These are: Social interaction, performance, excitement, esteem, and diversion. In our discussion of this topic, we will discuss how sport marketers use the Big 5 sport motives in an attempt to persuade individuals to consume a sporting experience. 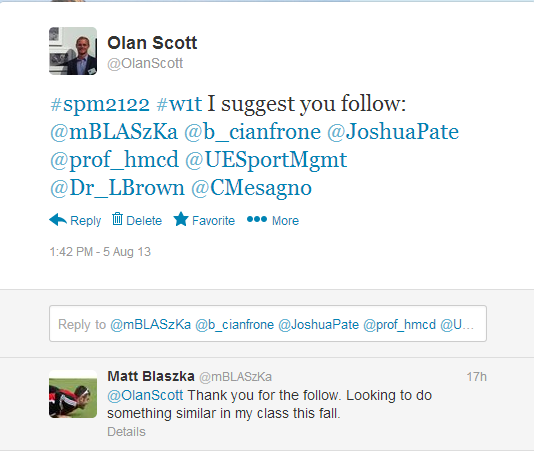 As many of my readers know, I actively use twitter in my university classroom teaching. 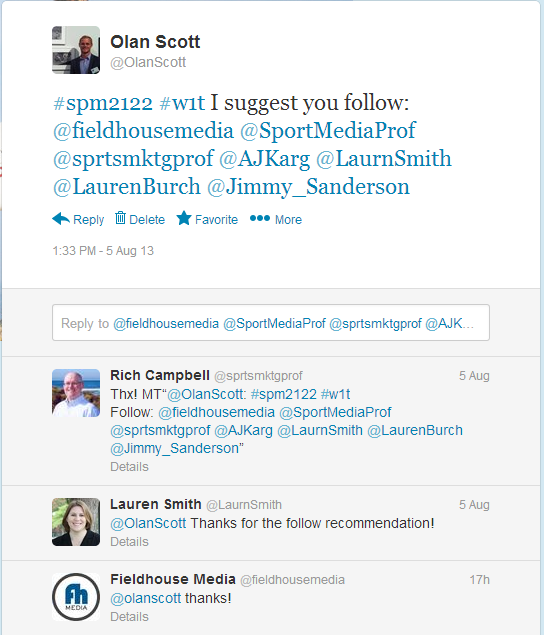 In particular, I use it most in my Sport Marketing unit (tagged #spm2122). 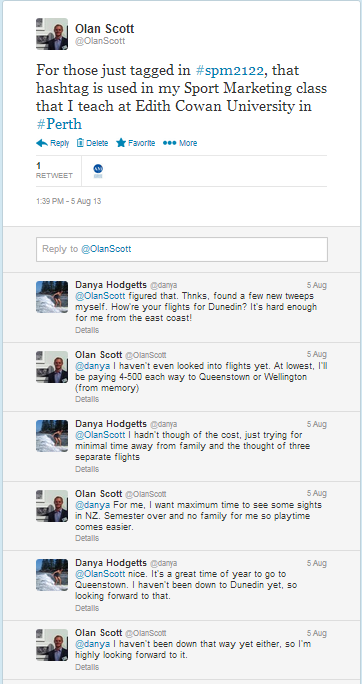 This semester I decided to change the direction of the students’ weekly tweeting. Normally, students are to tweet about course related content from that particular week twice per week. This has led to an unfocused, for want of a better term, number of tweets which don’t lend themselves to good class discussions both online and offline. As such, I have decided to switch it up this semester and set weekly tasks for the students based on lecture content. It is my hope that this new approach fosters enhanced engagement with course materials and drives the conversation better students more effectively. To encourage take up and participation with Twitter the weekly tasks are only posted on Twitter. As such, students must engage with the site on a regular basis because the social media materials are not posted to the course portal. I’ll update this post throughout the semester with tweets for the weekly tasks and my opinions on how it goes compared to how I’ve taught with twitter in the past. Of course, I feel that I need to actively participate in the weekly tasks to both encourage students to actively follow the hashtag and to increase engagement with the materials. As such, I completed the task a few days later. I suggest 30 accounts that the students follow and several hashtags that will help them apply out unit content to real world examples. Thanks for reading this post so far and it’ll be updated with the other tasks and my thoughts on the tasks as we move throughout the semester.